Under the headline “Negative Emotions are Key to Well-Being,” Scientific American writer Tori Rodriguez cites research by Jonathan Adler ’00 pointing out that both unpleasant and enjoyable feelings play a big role in helping us make sense of life’s ups and downs. 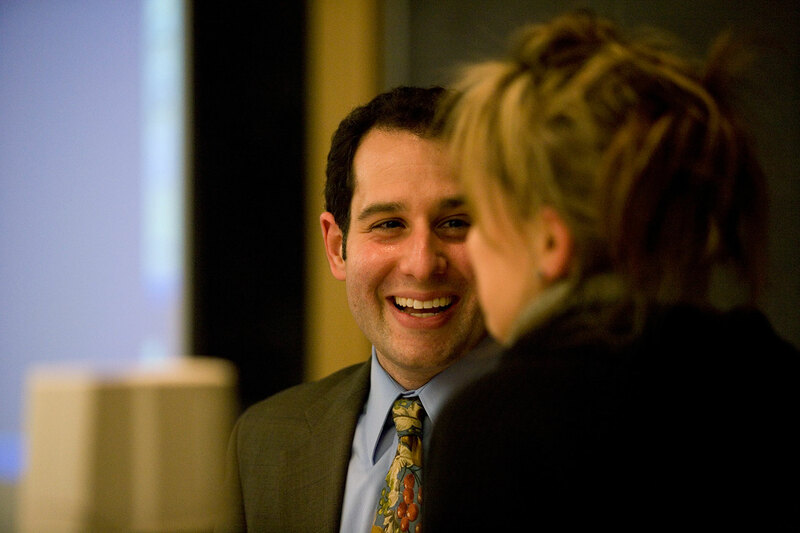 Psychologist Jonathan Adler ’00 talks with Kati Vecsey of the theater department during his lecture at Bates in 2008. Photograph by Phyllis Graber Jensen/Bates College. “Remember, one of the primary reasons we have emotions in the first place is to help us evaluate our experiences,” says Adler, an assistant professor of psychology at Olin College. Rodriguez describes how Adler and a colleague investigated the link between mixed emotional experience and psychological welfare in a group of people undergoing 12 sessions of psychotherapy. Participants who said they felt cheerful and dejected at the same time (for example, by expressing the notion that “I feel sad at times because of everything I’ve been through, but I’m also happy and hopeful because I’m working through my issues”) preceded improvements in their sense of well-being. “Taking the good and the bad together may detoxify the bad experiences, allowing you to make meaning out of them in a way that supports psychological well-being,” the researchers found.